Did Russia play a role in OPEC's decision to cut production? 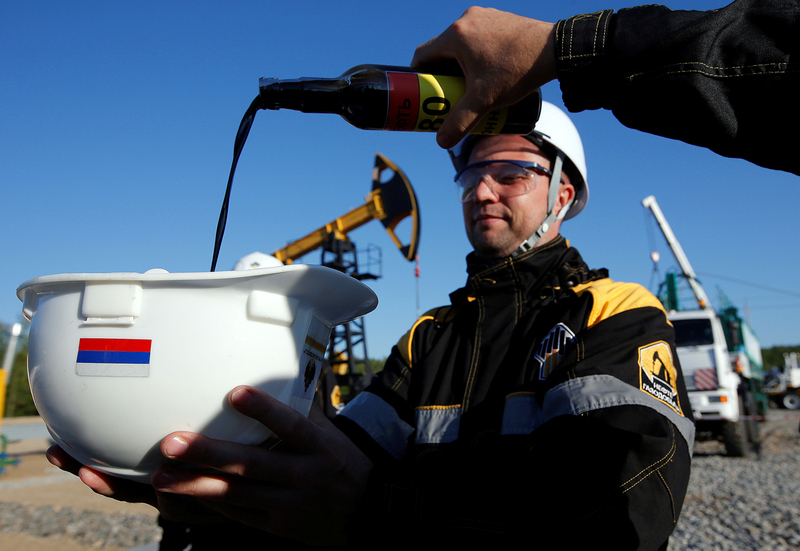 Employees demonstrate a sample of oil from a well at the central processing facility of the Rosneft-owned Priobskoye oil field outside the West Siberian city of Nefteyugansk. Russian analysts believe that OPEC's decision to reduce production volumes was in many way influenced by the Russian government, which has worked hard to try to reconcile the positions of Iran and Saudi Arabia throughout the year. Petroleum exporting cartel OPEC has decided to cut oil production for the next six months, sparking a dramatic strengthening of the Russian currency. The ruble grew by 10 percent in relation to the dollar and the euro, reports the Kommersant business daily. Additionally, according to Reuters, in the wake of the announcement by the cartel on Dec. 1 the price of Russia's Urals brand increased by nine percent to $47.51 per barrel, which is a maximum since Oct. 31. Russian analysts note that oil prices and the ruble are growing not only because of OPEC's decision, but also because Russia participated in the agreement. "OPEC's decision can be described as historic. For eight years the organization had been unable to agree on anything and for two years a price war was being waged," said Oleg Bogdanov, chief analyst at Teletrade Group brokers. Since Russia has always had a big role in the negotiation process, it is possible that the talks that took place at the end of November 2016 between OPEC representatives and Russian Energy Minister Alexander Novak were key to the successful agreement in Vienna, said Bogdanov, who explained that Russia has decided to cut production by 300,000 barrels per day. "OPEC and Russia demonstrated that the oil market is under control and it can be regulated depending on the situation in the global economy," he said. "Throughout the year producers were persistently increasing production volumes, which threatened to collapse the market with overstocked supplies. With the agreement now made, it can be assumed that the competition for market shares will stop and the market will stabilize," said Andrei Kochetkov, an analyst at Russian financial services company Otkrytie Broker. In February 2016 Russian Energy Minister Alexander Novak asked Saudi Arabia, Qatar and Venezuela to freeze oil production at the January level if other oil-producing countries joined the initiative. Saudi Arabia was against the agreement since Iran was not ready to freeze production volumes: After the removal of sanctions Tehran was trying to regain a share of the market and decided to increase production volumes from 1.5 to 2 million barrels per day. However, as Russian President Vladimir Putin said in an interview with Bloomberg in September 2016, it is possible to freeze production volumes even without Iran's participation. OPEC's decision to reduce quotas has turned out even better than the conditions that Russia had expected, since formally it is not obliged to cut production. "At the moment, Russia has an advantage since prices are growing and it has the potential to expand its exports," explained Sergei Kozlovsky, director of the analysis department at Grand Capital. Furthermore, a price growth to a level of $53-55 per barrel will force non-OPEC oil-producing countries to raise their production, said Ivan Kapitonov from the Russian Presidential Academy of National Economy and Public Administration’s Higher School of Corporate Governance. In his words, expectations about shale companies filing for bankruptcy were not met. Also, with the growth of oil prices new deposits will doubtlessly be introduced. As soon as the oil price exceeded $45 per barrel, there has been a monthly growth in the number of drilling rigs in the U.S., which indirectly implies that new wells have been opened. On average, the number of drilling rigs in the US increased from 464 in August 2016 to 509 in September to 544 in October. Yet this is still 247 units fewer than in October 2015, when there were 791 rigs. "Thus, in the following three-four months we should expect the growth of prices and the growth of production in the U.S., which will obviously be even greater with prices today being beyond $52," said Kapitonov, adding that in the future this could lead to a new fall in oil prices.